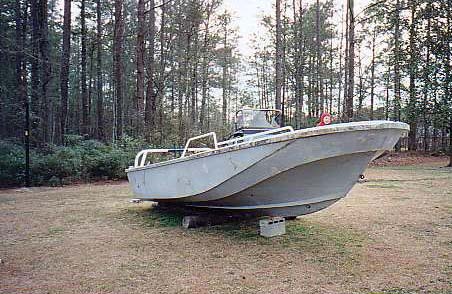 "This is a 1985 22-foot commercial built Whaler that was left to die by the Pamlico Sheriff Dept. From what I've gathered this Whaler was designed for the Navy Seals. It was bought on auction in December of 1999 by a good friend of mine who only wanted the double axle trailer that went with it (auction price ended at $200). Rumor had it that the local Sheriff wanted to make a drug boat out of her, but the Commissioners would not free up any money. 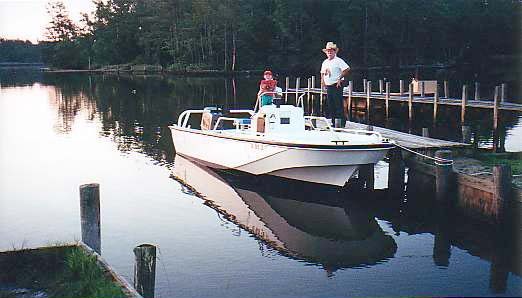 "On New Year's Eve night 1999 I went to my good friend's house not knowing he had bought this old Whaler. After a few drinks he asked me if I was still looking for a boat and I said "Yes"! We walked into his back yard around 10 p.m.--I could hardly see a thing--and he says to me "Here she is, yours for FREE, but I keep the trailer! My friend towed it to my house one week later to begin the rebirth of this "WORK HORSE"!. 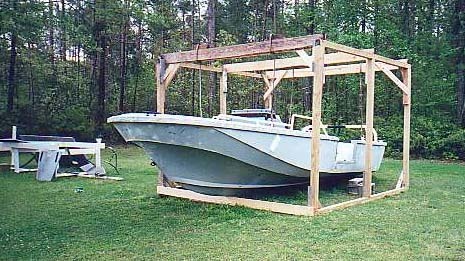 A "free" boat in the backyard. 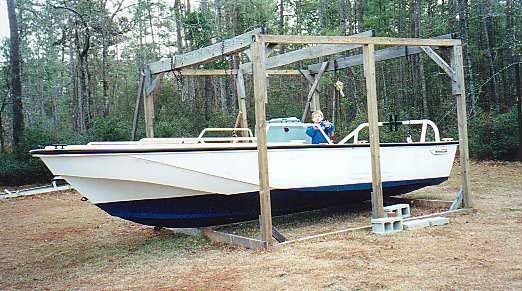 "With the help of my father I built this stand that went around the Whaler. Its purpose was to keep her level while I walked about her. Four come-alongs were mounted, two in front and two in back to lift her up for bottom work and also to raise her for the day she would sit on a trailer. But wood bows under severe stress and the idea floundered. The only thing that really worked was the fact she stayed level. When I cleaned out the center console I found a bunch of screws and bolts and some very deteriorated papers that said Portsmouth, Va. and the word Navy appeared several times but I couldn't make it all out. As you can see on the port side there is a removable side hatch door and from what I've been told from a few Navy guys it was removed while the boat was traveling so the SEAL team could rescue its soldiers out of the water without coming to a complete stop. There is also a large tow bar on the stern and four metal eyes, two toward the stern and the other two toward the bow and they could be used to lift the boat out of the water and placed on a deck of a ship. As you may be able to see, the nylon straps coming down are shackled into the eyes." 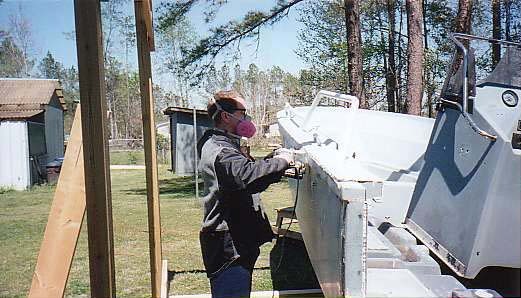 "All the aluminum grab rails, cleats, tow bar, etc., have been triple coated in gloss white enamel. I also started working on the chips and blisters in the outer hull, filling and sanding using West System epoxy. 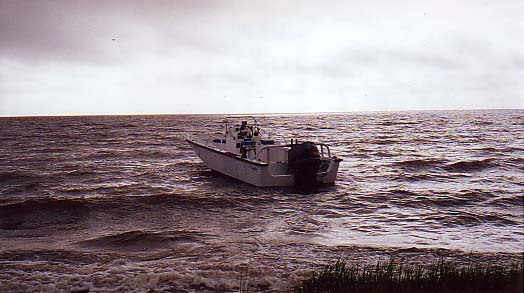 This Whaler at one time had twin outboards, probably 90-HP [135-HP]. They were Evinrude or Johnsons because the tachometers were still present in the console and they had OMC on them. 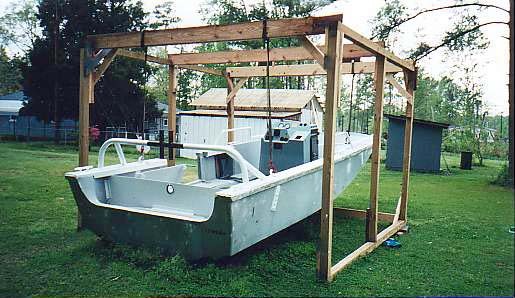 I'm also under extreme pressure from my wife who wants the boat out of the yard, but 15 months from now I won't be able to keep her off of it!" "I am sanding away on the area that once was the rub rail. I'm using a belt sander in this area because it's a lot quicker. People are starting to drive by my house slowly and about to break their neck to see what I'm doing or how far I'm coming along in this project." "I'm under the boat and I'm sweating like a pig. I'm done fixing the chips and blisters and I have three fresh layers of white gel coat on the hull. And I'm using a palm sander to prep the bottom for a silver primer and a couple layers of blue bottom paint." "I've got the rub rail installed, the Boston Whaler decals on, and a couple coats of blue paint on the bottom along with one coat of primer to give the blue paint a strong contact. People are staring to ask me "Isn't that the boat the was once behind the Sheriff's Dept?" 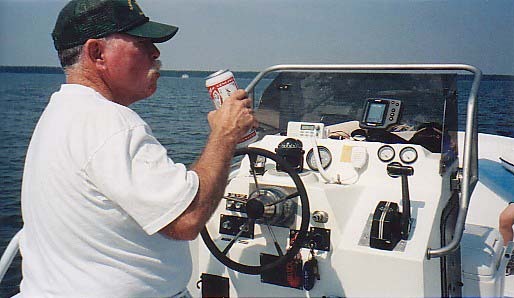 And my good friend that gave me the boat now wishes he had kept it. He says, "I never saw any potential in her." 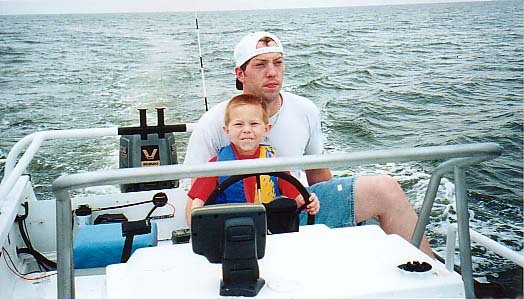 The little boy on the boat in the picture is my son, my soon to be Admiral." "I have finally got her up on a Royce double-axle float-on trailor. For my power plant I mounted a 200-HP Suzuki V-6. To get the boat on the trailor I had help with my father and my good friend who gave me the boat. 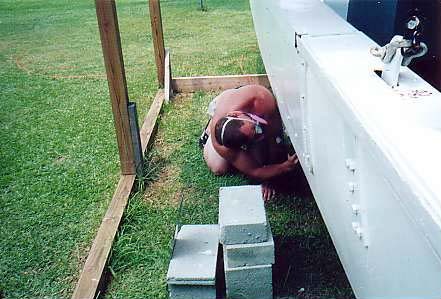 Mounting the engine was easy: we built a tall square frame out of salt treated 6x6 and cemented them in the ground. We then took a sling, a come-along, and a threaded screw-in bolt with a eye on the end that was made by a local machinist and screwed it in the fly wheel. It took about 20 minutes to lift the motor, line it up and bolt it in. I've also started gel coating the inside of the boat, the console is now white. I finally got the registration straightened out with the state of North Carolina and the numbers now appear on the hull. NC 9679 CU"
"I've added two padded seats in the front. 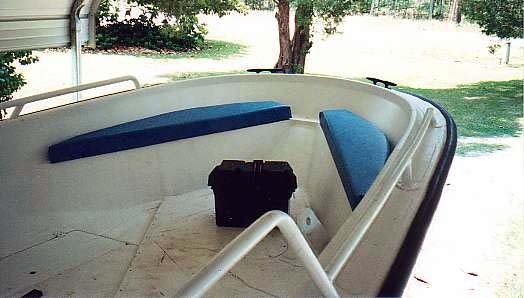 By using marine grade plywood, foam, and a blue marine grade material and installing it with only 5200 caulk I now have some comfy place to sit while I do some fishing. I used the 5200 because I'm not a big fan of drilling into a boat unless there is no other way around it." Launch Day June 3, 2001! "The day has finally arrived, and with our fingers crossed I unhooked the winch cable off the bow eye and watched her ever so gently slip into Ball Creek, which is located in Florence, NC. Makes you wanna cry doesn't it? On the dock stands my father Jerry Sawyer; on the boat is my son Austin, and holding him is my Uncle Lynn. I want to say I couldn't have done it without both of their help, they did a great job in doing all of the electrical work and helping me install a new 52 gallon fuel tank. I should have taken some pics of them wiring up this old girl but the pics would have been clutered with Budweiser cans and ill-tempered faces." "Even a five year old can handle a Boston Whaler! We're in the Bay River, top speed was 38 MPH. She handled like a dream. I ran her out to the edge of Jones Bay in some deeper water and began to play. She turned on a dime and left change. I ran across my own wake and she cut right thru. We did a little fishing while we were out but had no luck." "My 22-GUARDIAN is anchored off Maw Point overlooking Pamlico Sound. People ride by and break their neck to get a closer look. I can't even stop at the gas station to fill her up without someone coming over to ask me questions about it. Hopefully by the summer of 2002 I will have enough cash to put on a T-Top, a windshield, and give her a name. I thought about naming her "COLD WAR" since it was a ex-military boat built during the Reagan years at the height of the cold war with the U.S.S.R. Around $12,000 was put in this old WORK HORSE to get her back together, the biggest part of course was the motor and trailer and thank God they were used or the price would have been a whole lot more! It was worth every penny!" The page has been accessed 35405 times. This article first appeared July 23, 2002.